Some art works are so porous towards meaning, so sensitive to atmospheric conditions and the fingerprints of discourse, that we must be careful what words we use on them. Language can indelibly tarnish objects. Liz Larner’s best sculptures have always been hard to talk about with sufficient delicacy, none more so than the ceramic tablets which dominated her seventh solo exhibition at Regen Projects since 1989. These objects seem disarmingly simple. Each is a hunk of clay rolled out to a fat finger’s thickness, fired and coated with pigment and glossy epoxy resin. Similarly coated are ceramic buttresses that allow the tablets, when hung like paintings, to hover a few centimetres away from the wall. Arrayed at eye height around Regen’s unsympathetically large main gallery, these modestly scaled slabs wait demurely for visitors to approach. As you move through the space, they come alive; their reflective surfaces broadcast their dents and cracked edges, and iridescent pigments cause them to flash, dramatically, between colours – from teal to sage green to rose pink to inky black and brown – from one angle to the next. Most significantly, however, only one is a straightforwardly flat panel. Some have vertical, V-shaped indentations, while others crease outwards from behind. Three are what Larner terms ‘subductions’: slabs that have been cut, or broken, in the middle and then mounted so that one half slightly overlaps the other. There is shadow, then daylight, between the two halves as you move around the sculpture. How hard it is to describe these objects without resorting to similes. It’s tempting to compare them to black mirrors, switched-off televisions, animal hides or skateboard decks, even – but, in each case, the allusion serves only to constrict the sculpture’s specific quality. Larner herself is not innocent in this regard. She assigns each category of work a title according to its form: mantle (2013) is a flat, outrageously pink and purple lozenge, while viii (caesura) (2014) puckers up to reveal a turquoise-painted crack. Between the two terms, we begin to perceive Larner’s fusion of geology and poetry in her own conception of these works. Subduction, too, is a geological word (for the moment when one tectonic plate moves beneath its neighbour), while the literary terminology continues with titles such as inflexion and ii (passage) (both 2014). I don’t know how useful it is to think of sculptures such as i (subduction) (2014) in terms either of literature, geology or the body (which is the next, obvious association waiting to attach itself to these dimpled, scarred and fleshy surfaces). They seem to operate above and beyond language, as do two much larger sculptures in the same gallery. One is an X-shape in mirror-polished steel titled X (2013), and the other a curling, papier mâché form titled V (planchette) (2014). Both are magnificent and extremely difficult to describe, with or without recourse to similes. X was apparently constructed over an unspecified solid object, which was removed to create a low-slung ovoid form that now wraps itself around empty space. 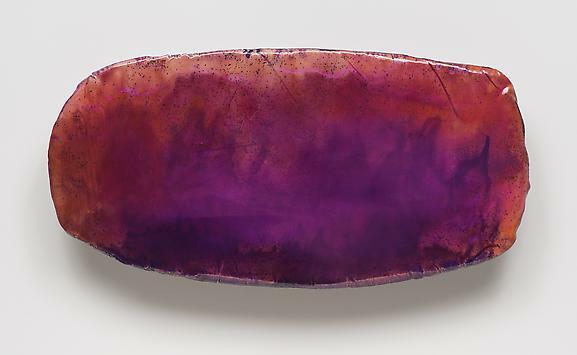 V (planchette), painted in the deepest blue-purple egg tempera, is more substantial, rising two and a half metres from the ground before it flops over – forgive me – like a giant tongue or the tail of a whale. A large, horizontal sculpture made from the same material, VI (planchette) (2014), is affixed to the wall nearby. Planchettes, apparently, are the heart-shaped pointers used with Ouija boards, or devices used for automatic writing in séances. This reference is more or less irrelevant to both sculptures’ profound effect on the viewer. It is impossible to resist drawing close to these mottled, light-absorbing surfaces (if only to try and grasp their elusive forms) and, once near, they hold you in their thrall. To stand beneath V (planchette) is to be almost entirely enveloped by an object that has made you its centre. These issues of form and content, purity and contamination, are picked up in a side gallery, which displayed some of Larner’s experiments with bacterial cultures on agar jelly. Orchid, Buttermilk, Penny (1987) is a pair of photographs showing one of her very first cultures in a petri dish, before and after the flower rotted to a grim mush. As images, they hold little of the fascination of the substance itself, which has unfortunately long-since turned to dust. Larner reprised the series with 110 Fwy, June Gloom and Shrimp Tacos (2013), the alleged essences of which were blooming, on my visit, into a yellow mould on the emerald agar. The mysterious surface seemed to me to be a workable analogy for the ceramic tablets in the other room. The unnecessary, over-elaborate stand that the petri dish sits on – a modified hubcap from a 1964 Dodge Dart – felt, like the tablets’ titles, as though it were forcing something onto the work that was better left unsaid.